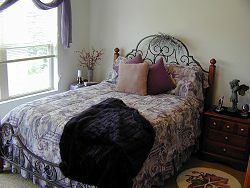 The main bedroom of the lower floor is beautifully decorated in pastel purples. 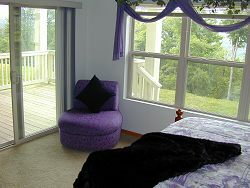 Enjoy direct access to the lower deck and yard from the Purple Bedroom. 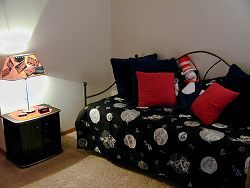 The Red Bedroom also features direct access to the lower deck. 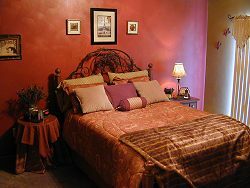 Another view of the Red Bedroom. 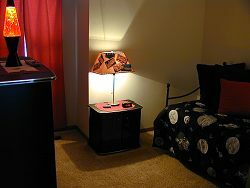 The "Chinese" Bedroom makes a cozy kid's room and has its own TV, VCR and lava lamp! full size mattress or 2 twin beds. 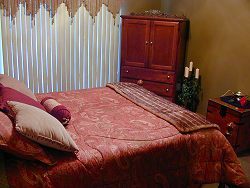 All three bedrooms have their own, full bathrooms.